Just a quick heads up Safeway has iTunes Cards on sale until Sunday, November 25th as noted in their Grey Cup flyer. $30 multipacks and $50 cards are 20% off, and this makes another opportunity to stock up cards for Christmas gifts. Don’t forget, if you’re near a Best Buy they have $50 iTunes Cards on sale for $11 off, as part of their ongoing Black Friday sale. 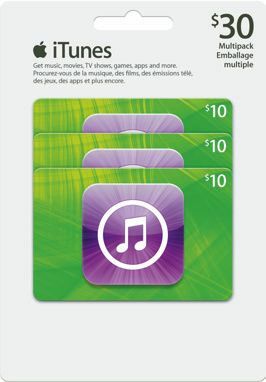 These cards can be used to fund your iTunes Account towards purchases in the App Store, Mac App Store, iTunes, and iBookstore. By funding your account with 20% off cards, you will continue to save on any digital purchases from Apple.